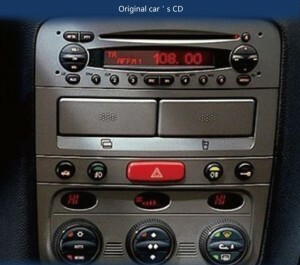 It’s a picture of the original Alfa Romeo 147 CD stereo. We can see that the unit is consisted of 4 parts. And, the 2 parts at the bottom are together. In most cases, the new unit should be installed in the position of the first and the second part. So, we just need to remove the top part and the middle part of this unit. Before the removal, there’s something you should pay attention to. If you are a green hand on car stereo upgrade, you should ask a professional for help to ensure security and the correct installation of the new unit. You should remove the negative cable on the vehicle battery before the removal, too. 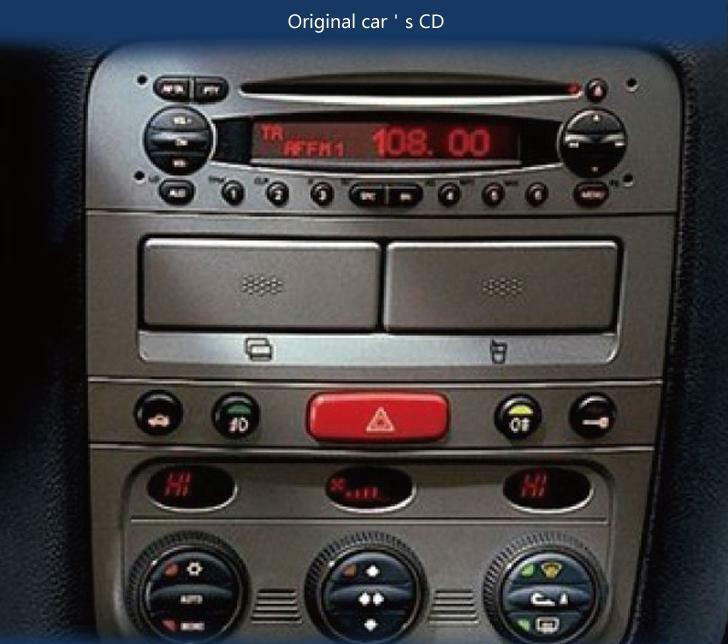 The following steps are for removing the Alfa Romeo 147 CD stereo from 2005-2013 which has the same panel as the one above. You can refer to it but not all rely on it. Remove the top part of the unit. The top part has 4 holes on its panel. You should use a pair of 2 din release keys to insert to the holes. One for the two holes on the left, and the other one for the two holes on the right. Then, stick the keys hard so that they hook the unit tightly. At last, pull the keys to take the unit out of the dash. There are wires at the back of this part. Disconnect them and put the unit away. Remove the middle part of the unit. Use a plastic lever to loosen the panel of the second part and take it off. You may need a screwdriver to loosen the main part of the second part and release it from the cradle in the dash. Now, the original Alfa Romeo 147 CD stereo has been removed. You can connect the new unit to the car now. If you don’t know how to connect the wires, you’d better ask for a wiring diagram from the dealer or ask professionals for help. If it needs a wiring adapter, first connect it to the original wiring harness, then to the new unit. 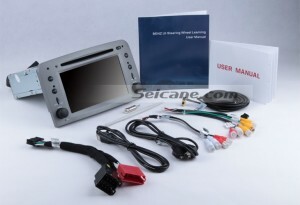 Once the connections are done, turn on the new unit to test the functions in it and see if it is compatible with your car. Wrong wire connections will bring problems to the usage. You can double check the wires if there’s any question. This functional head unit comes with touch screen, radio RDS, GPS navigation system, Bluetooth, IPod and so on. You can get fun and help from it during driving. There are some optional functions in this unit. Please make sure you have chosen all the functions you want with the unit when placing order. If you are not sure whether it fits your car, you can ask the online customer services or send a picture of sales@seicane.com and ask for sure. Wish you like this unit and enjoy shopping on Seicane.com.